I am linking up for Five Minute Friday a five minute free write with a word prompt each week. 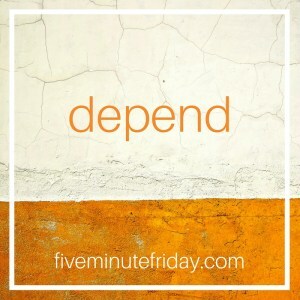 Today’s prompt is “Depend.” http://fiveminutefriday.com. I know some people who think we have it so easy without a husband, “you must have so much time”. Without kids, “that’s why you still look so young for your age” people say. They are just pushing the knife deeper in to my wound. While those things hurt, I think the hardest one for me is having no one else I can depend on. I learned a long time ago that I had no choice but to depend on myself. So I change my own tires, I hang my own pictures, I put together my own furniture, I pug in my own heavy packages, I take out my own trash. I have to do it all by myself. I don’t consider myself a particularly lonely person. I’m introverted, so I don’t need people around all that much. Every once and a while, though, I come home after a rough day and really wish I had someone to be with. Someone who would try to fix my problems. Someone to complain to. Someone who would fail to see my expectations, some who would hurt me, someone to be a witness for my life. Someone to depend on. But I don’t. I depend on myself to get things done. To pay the bills. To do the hard stuff. I just don’t buy the stuff that’s too heavy to lift. It's a tough place to be, Stephanie. I'll keep you in my prayers, if I may. Love your honesty here – and love that you are writing. Thanks for sharing your heart and your gift. I'm so sorry. Here's a big (((HUG))) – wish it could be in person. Dear Stephanie people mean well don't they? Dear Jesus, wrap your arms around your child today.